IMPA ACT is a management system that helps marine purchasers and suppliers become responsible in the way they manage their supply chain. This is how it works. the 10 universal principles of the UN Global Compact that require businesses to operate in ways that, at a minimum, meet fundamental responsibilities in the areas of human rights, labour, environment and anti-corruption. Take a look at these principles here. the 31 UN Guiding Principles on Business and Human Rights that form the first global standard for preventing and addressing the risk of adverse impacts linked to business activity. This set of principles is more process-oriented, detailing the business requirements for due diligence in the form of human rights impact assessments and remediation. Give these principles a read here. The OECD Guidelines for Multinational Enterprises that provide non-binding principles and standards for responsible business conduct in a global context consistent with applicable laws and internationally-recognised standards. Have a look at the guidelines here. 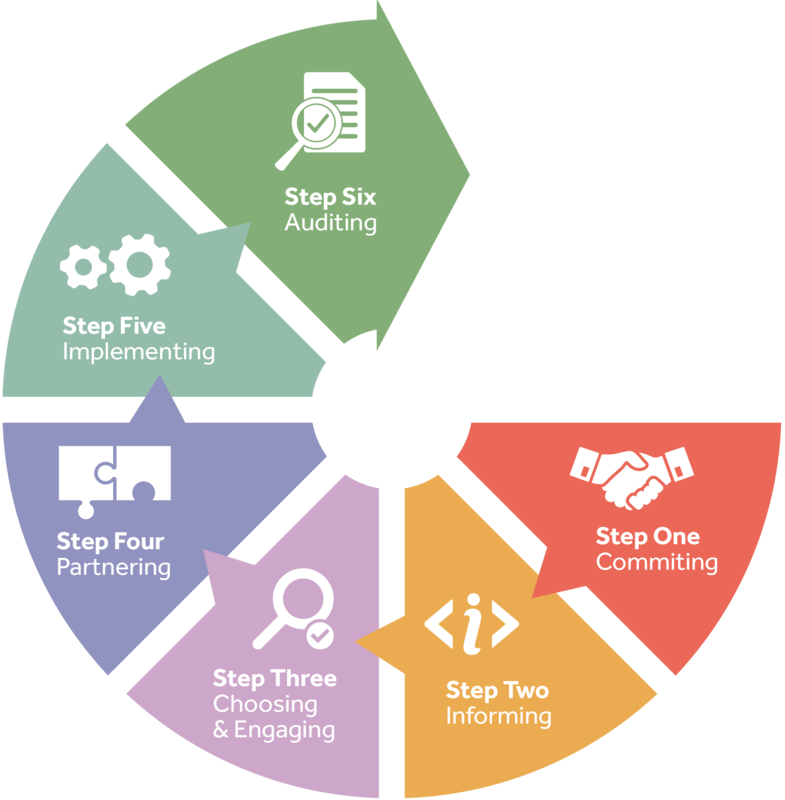 All IMPA ACT members, whether buyers or suppliers (in their quality as purchasers), get access to a six-step implementation process that breaks down the work needed to engage suppliers and build the systems required by the SCoC throughout your supply chain. Everyone starts the programme by internally commiting to the SCoC through issuing a policy commitment. The company then undergoes steps two to five. It informs all suppliers about the new requirement of complying with the SCoC by incorporating it into contracts, chooses some suppliers depending on spend and dependency, partners with those who are not versed in CSR as per their answers to a detailed assessment, and works with them to implement the SCoC's requirements. At step six, the company evaluates or "audits" suppliers who are deemed to be ready. If successful, they become Preferred Suppliers. If not, the partnership continues until eventually ready. A Toolbox of resources and materials broken down according to the six-step process. For each step, you will find practical guidance (e.g. an implementation plan for using the SCoC, an issue-management plan that enables adequate reactions whenever a glitch is identified, etc. ), samples (e.g. examples of good comprehensive policy commitments) and a variety of templates that help you streamline the process (e.g. contract clauses to include in sale contracts, letters to engage suppliers. etc.). A Knowledge Centre containing educational material on responsible supply chain management, industry updates, reports, statistics, risk assessments and more. What exactly makes IMPA ACT different than other systems? The IMPA ACT programme takes the partnership approach at its core and not the usual command-and-control approach. The programme allows for ample time to finalise implementation (often three years or more), as it acknowledges that smaller businesses might not have resources to implement it in one go. As an initiative for the global shipping industry, we also want to be as inclusive as we possibly can. Buyers begin the work on the programme by advising their entire base of suppliers of the new requirement of being compliant with the SCoC. They then engage a handful of suppliers each year, the number being contigent upon the resources that their companies are willing to allocate, and work with the suppliers towards building up the necessary systems required by the SCoC. They do this within their own companies at the same time that suppliers are undertaking it in theirs. As they constantly exchange information and best practice with suppliers, the process becomes streamlined. Suppliers are either engaged by one of their customers to begin working on the SCoC or express their support individually by signing up to the programme and issuing a public policy commitment, as per the SCoC's first requirement; IMPA ACT will then promote their business in the Sustainable Maritime Suppliers section and advertise them as looking for a partner. It is expected that suppliers, while working to internally implement the SCoC, will undertake the same work required from a purchaser within their own chain of sub-suppliers. Still unsure how the whole process works? We are aware that most companies already have long-established processes to meet their mandatory duties towards labour rights, anti-corruption and the environment. However, by becoming an IMPA ACT Member or Supporter and committing to putting a responsible supply chain management system transcends this basic legal compliance. IMPA ACT is about acting responsibly and being a good corporate citizen, and part of this responsibility is to ensure that businesses in your value chain are acting the same. For a more extensive discussion on how the IMPA ACT programme works, feel free to contact us. Alternatively, if you just have a question or two, why not take a look at our Frequently Asked Questions? You might find your answer there and be ready to get involved next. You too can become a sustainability front-runner.